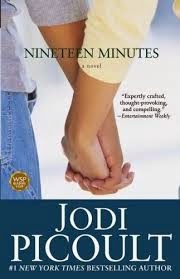 a book chick: "Nineteen Minutes"
my take: When I asked a young friend what she likes to read, without hestitation she answered "anything by Jodi Picoult." Hmmm. I've actually never read anything by Jodi Picoult. I think there was a general buzz about My Sister's Keeper when that came out but I was busy reading other things. She suggested starting with Nineteen because it was one of her favorites. She's reading through Picoult's works much like I am reading through Ann Patchett's works. What can happen in 19 minutes? The story opens with lots of options. The bulk of the novel is centered around the 19 minutes that one character uses to shoot his school mates. His mother, the girl who once was his friend, her mother, the shooter ... as each character's story is shared the reader gets the gut-wrenching insider perspective of what it might be like to live through this event. I'm not capable of reading a Jodi Piccoult book without a box of kleenex on hand. I've only read a handful of them because I tend to pick other books instead usually, I think because I know there is usually a pretty depressing element to the storyline. I do think she's a great storyteller and you can always count on a good twist that you didn't necessarily expect. Nineteen Minutes is probably my favorite that I've read so far.